Alexandrite is a rare member of the Chrysoberl family and exhibits distinctive and unique color changes. The most common gem quality stone, when observed in daylight, is green, whereas when observed under artificial (tungsten) light the stone is bright red. Commonly the stone is yellow, brownish-yellow, greenish-yellow, green, brown. 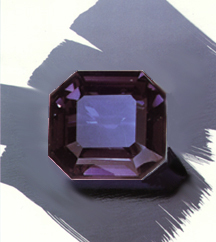 Alexandrite from the Urals is blue-green in daylight and bright purplish-red under tungsten light. The stone from Ceylon is olive-green to brown in the day light and red under artificial light. The stone was once thought to be a variety of Krisoberil, thus the present name of Chrysosberyl. As with all gemstones, protect your Alexandrite from scratches and sharp blows. Clean your Alexandrite jewelry by immersing it in lukewarm soapy water and using a small, soft brush or a home ultrasonic, steam or jewelry cleaner. Alexandrite is treasured as a gift for June birthdays and celebration of the 45th and 55th wedding anniversary. Alexandrite has long been regarded as a good omen.